The server-processor market is creating openings for new vendors. With the emergence of mega data centers and cloud computing, server economics no longer focus on capital expenses alone. Demand for ultimate performance from a single processor has been replaced by a balanced view of capital and operating costs. Performance per watt and performance per watt per dollar are the new metrics driving purchasing decisions in large data centers. Physical density is also growing in importance, driving greater scalability and new form factors such as high-density servers that pack more nodes into precious rack space. In this new era, backward compatibility is less important than before and innovation takes the front seat. Intel and AMD — the incumbent vendors — continue to innovate and advance their Xeon and Opteron designs, respectively. Integration, microarchitecture advances, and process technology are the primary factors in x86 evolution. But new entrants are eyeing cloud-computing environments as an opening for radically different architectures, for more power-efficient ARM-based architectures, and for processors that integrate hardware accelerators. 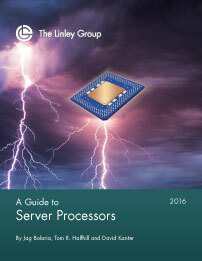 This report covers processors designed specifically for servers. 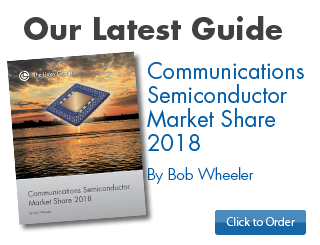 We provide detailed coverage of Intel’s Xeon E3v5, E5v4, and E7v4 product lines as well as Xeon D processors for scale-out applications. We cover AMD’s Opteron family, including Opteron X and ARM-based processors, plus AMD's joint venture with Tianjin Haiguang Advanced Technology Investment Company (THATIC). 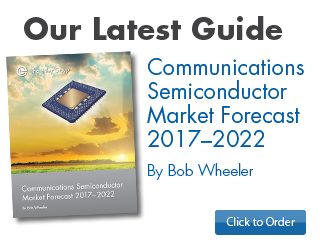 Other ARMv8-compatible products include AppliedMicro’s X-Gene 2 and Cavium’s ThunderX and ThunderX2. We cover IBM's Power8 and the OpenPower Foundation's future product roadmap. We speculate about potential market entries from Baikal Electronics, Broadcom, HiSilicon, Phytium, and Qualcomm. This edition also continues our coverage of coprocessors (or accelerators) for high-performance computing (HPC), including Intel’s Xeon Phi, Nvidia’s Tesla, and AMD’s FirePro. This report analyzes each vendor and each product, probing their strengths and weaknesses and presenting key details in a consistent, easy to compare fashion. 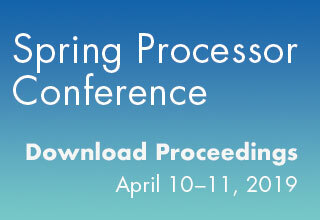 We examine processor performance, integration, power dissipation, and overall system design. Where possible, we also look at the vendors' roadmap. 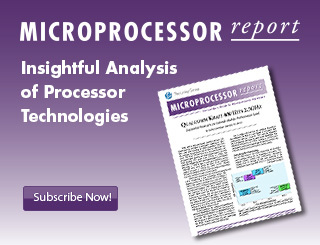 As the leading vendor of technology analysis for microprocessors, The Linley Group has the expertise to deliver a comprehensive look at these technologies. Our analysts use their broad experience to deliver the technical and strategic information you need to make informed business decisions. 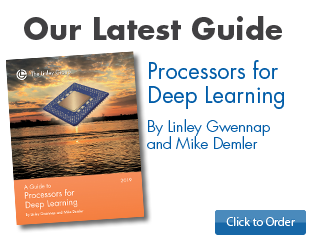 And in case you are not familiar with all of the concepts involved in processor and server designs, the report includes introductory chapters that define and describe terms such as superscalar, multithreading, pipelines, and virtualization. Trends that emerged a few years ago continue to transform the server-processor market. Although Intel still dominates with about 99% market share, glimmers of new competition are appearing. Cloud computing and hyperscale data centers operated by companies such as Amazon, Apple, Facebook, Google, and Microsoft are creating opportunities for ARM-based vendors to challenge the x86 status quo. Even Intel’s old nemesis, AMD, is trying to make a comeback. Rumblings in China and Russia hint at fresh competition from afar, motivated by nationalist policies that encourage independence from U.S. technology. In the near term, these trends will fail to challenge Intel’s dominance, but they are a bellwether of things to come. Until recently, processor performance and capital expenses were the vital metrics for server customers. Today, long-term operating costs are equally important. Performance-per-watt and performance-per-watt-per-dollar are the new metrics driving purchasing decisions in large data centers. Physical density is also growing in importance, driving greater scalability and new systems that pack more nodes into precious rack space. Although software compatibility remains important, data-center customers are willing to adopt new platforms if the cost savings and performance are compelling. But ARM’s challenge to the incumbent x86 architecture is unfolding slower than stakeholders expected. By mid-2016, only three companies were shipping 64-bit ARM-compatible server processors: AMD, AppliedMicro, and Cavium. None of their initial products comes close to Xeon in performance or performance-per-watt, except on a few niche applications. Although more competition is coming soon, so far Intel’s newest Xeon and Xeon D products are more than holding their own. Another new challenger, IBM, formed the OpenPower Foundation to promote its Power Architecture. The company’s Power8 server processors are now available on the merchant market. So far, however, they suffer from power-efficiency handicaps that won’t be addressed until the next-generation Power9 debuts in 2017. Server processors are offering more CPU cores and more threads, which are valuable for parallel processing—running multiple tasks at the same time. Intel’s Xeon now offers as many as 24 cores and 48 threads per chip. Cavium’s ThunderX CN8890 has 48 single-threaded cores. These high-thread-count processors are valuable for big-data analytics, web servers, scientific computing, transactional databases, and other applications. For low-cost processors targeting high-density servers, system-on-a-chip (SoC) design is now common. By integrating several functions that previously required two or more separate chips, SoCs can cut costs, reduce power consumption, and save board space. Those functions typically include memory interfaces and I/O interfaces. More often, they also include hardware accelerators for specialized tasks. All ARM server processors announced to date are SoC designs. Intel’s new Xeon D combines the CPU and south-bridge chips in a single package, mimicking these SoCs, but it still lags in hardware acceleration and networking integration. Intel maintains a shrinking lead in chip-fabrication technology. The newest Xeon processors are built in 14nm FinFET technology, which reduces cost and power while improving transistor performance. By contrast, all non-Intel server processors are currently manufactured in older technologies without FinFETs. But several server processors built in 14nm or 16nm FinFET processes will ship in 2017. The other x86 vendor, AMD, is struggling financially and has allowed its Opteron x86 server processors to fall far behind. Its initial ARM-based server chips are also unexciting. The company is betting almost everything on its next-generation Zen microarchitecture. The first Zen-based server processors are due to ship in mid-2017, however, so AMD’s fortunes will change slowly. To generate new revenue and open a new market, the company has licensed its processor technology to a Chinese joint venture (Thatic). AppliedMicro’s third-generation X-Gene 3 will have 32 cores — a big leap over the octa-core X-Gene 2. If the company can deliver this product by the end of 2017, it will have the first ARM-based processor that compares well against Xeon E5 in per-thread and multithread performance, thrusting the company squarely into the mainstream server market. ThunderX has already shipped for millions of dollars in revenue. Cavium is already working on 54-core ThunderX2 with improved performance that is due for production in 2H17. The company badly missed its targets on the first ThunderX, however, and needs to focus on execution. Qualcomm recently confirmed that its first server processor, which will likely have 32 ARM cores, is on track for production in late 2017. Broadcom has also been developing a powerful ARM-based server processor, but the project may be sold or shut down after Avago’s recent acquisition. More competition may come from Baikal (Russia), HiSilicon (China), and Phytium (China). All are developing ARM-compatible server processors. But their early products are unlikely to be competitive with those from established vendors. High-performance server processors are difficult to design, and the first chips will be built in older fabrication technology. The Chinese and Russian governments — increasingly resentful and suspicious of U.S. technology — are encouraging or actively backing these projects. These new companies won’t compete globally in the near term, but they could block foreign competitors in their local markets. What Is a Server Processor? Figure 1-1. Basic processor design. Figure 1-2. Simple superscalar processor design. Figure 1-3. CPU pipelining examples. Figure 1-4. Block diagram of a typical server processor. Figure 1-5. Interleaved tasks on a multithreaded CPU. Figure 3-1. Typical single-processor server architecture. Figure 3-2. Typical multisocket server architecture. Figure 3-3. Rack-mount servers and a standard-size rack. Figure 3-4. Lenovo’s BladeCenter H.
Figure 3-5. Typical blade-server architecture. Figure 4-1. Cisco M-Series Modular Server. Figure 4-2. Facebook’s Yosemite design. Figure 4-3. Server-processor shipments by segment, 2015–2020. Figure 5-1. Intel server-processor roadmap. Figure 5-2. Block diagram of Intel Broadwell microarchitecture. Figure 5-3. Block diagram of Intel Broadwell server processor. Figure 5-4. Block diagram of Intel Silvermont microarchitecture. Figure 5-5. Server design based on Intel Xeon E3v5. Figure 5-6. Server design based on Intel Atom C2570. Figure 5-7. Server design based on Intel Xeon D-1500. Figure 5-8. Two-socket server design based on Intel Xeon E5-2600v4. Figure 5-9. Four-socket server design based on Intel Xeon E7v4. Figure 6-1. Block diagram of AMD Bulldozer/Piledriver CPU module. Figure 6-2. Block diagram of AMD Opteron A1170 server processor. Figure 6-3. Two-socket server design based on AMD Opteron 4300. Figure 7-1. Block diagram of AppliedMicro Potenza CPU core. Figure 7-2. Block diagram of AppliedMicro X-Gene 2 processor. Figure 7-3. Kontron X-Gene1 node for the Symkloud platform. Figure 7-4. Block diagram of AppliedMicro X Gene 3 processor. Figure 8-1. Block diagram of Cavium ThunderX CN8890NT. Figure 8-2. Two-socket server design using Cavium ThunderX. Figure 9-1. IBM Power8 memory architecture. Figure 9-2. Block diagram of IBM Power8 CPU core. Figure 9-3. IBM Power8 multiprocessor cluster. Figure 10-1. Microarchitecture of Intel Knights Landing CPU. Figure 10-2. Block diagram of Intel Xeon Phi 7200 processor. Figure 10-3. Block diagram of Nvidia Pascal GP100 core. Figure 10-4. Block diagram of Nvidia Tesla P100 accelerator. Figure 10-5. Block diagram of AMD Hawaii compute unit. Figure 10-6. Block diagram of generic high-performance compute node. Figure 10-7. Block diagram of Intel Xeon Phi compute node. Figure 13-1. Server-processor performance comparison. Table 1-1. Selected SPEC benchmarks. Table 4-1. Worldwide revenue of the leading vendors of merchant server processors. Table 5-1. Summary of selected Intel x86 server processors. Table 5-2. Key parameters for selected Intel Atom server processors. Table 5-3. Key parameters for selected Intel Xeon E3v5 server processors. Table 5-4. Key parameters for selected Intel Xeon D processors. Table 5-5. Key parameters for selected Intel Xeon E5 dual-socket procesors. Table 5-6. Key parameters for selected Intel Xeon multisocket processors. Table 6-1. Key parameters for AMD Piledriver-based Opteron processors. Table 6-2. Key parameters for selected AMD Opteron processors. Table 6-3. Key parameters for AMD Opteron X2150. Table 6-4. Key parameters for AMD Opteron A-Series processors. Table 6-5. Key parameters for AMD SR56x0 north-bridge chips. Table 6-6. Key parameters for AMD SP5100 south-bridge chip. Table 7-1. Key parameters for AppliedMicro X-Gene processors. Table 8-1. Key parameters for Cavium dual-socket ThunderX processors. Table 9-1. Key parameters for IBM Power8 merchant processors. Table 10-1. Key parameters for Intel Xeon Phi 7200 processors. Table 10-2. Key parameters for Nvidia Tesla coprocessor cards. Table 10-3. Key parameters for Nvidia compute cores. Table 10-4. Key parameters for AMD FirePro S-series coprocessor cards. Table 10-5. Key parameters for double-precision HPC server nodes. Table 10-6. Key parameters for single-precision HPC server nodes. Table 11-1. Emerging server-processor vendors. Table 12-1. Comparison of SoCs for high-density servers. Table 12-2. Comparison of processors for single-socket servers. Table 12-3. Comparison of processors for two-socket servers. Table 12-4. Comparison of processors for four-socket servers.